A new cohort of young women—members of the so-called Millennial generation—has been entering the workforce for the past decade. At the starting line of their careers, they are better educated than their mothers and grandmothers had been—or than their young male counterparts are now. But when they look ahead, they see roadblocks to their success. They believe that women are paid less than men for doing the same job. They think it’s easier for men to get top executive jobs than it is for women. And they assume that if and when they have children, it will be harder for them to advance in their careers. While the public sees greater workplace equality between men and women now than it did 20 to 30 years ago, most believe more change is needed. 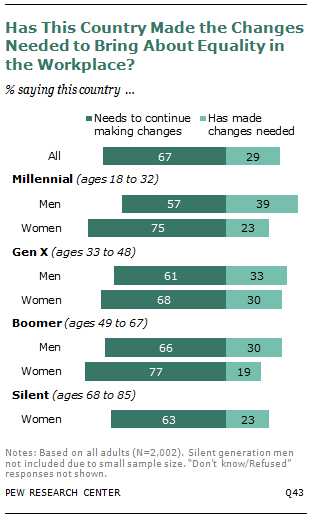 Among Millennial women, 75% say this country needs to continue making changes to achieve gender equality in the workplace, compared with 57% of Millennial men. Even so, relatively few young women (15%) say they have been discriminated against at work because of their gender. As Millennial women come of age in the “lean in”1 era they share many of the same views and values about work as their male counterparts. They want a job they enjoy that provides security and flexibility, and they place relatively little importance on high pay. At the same time, however, young working women are less likely than men to aspire to top management jobs: 34% say they are not interested in becoming a boss or top manager; only 24% of young men say the same. The gender gap on this question is even wider among working adults in their 30s and 40s, the age at which many women face the trade-offs that go with work and motherhood. These findings are based on a new Pew Research Center survey of 2,002 adults, including 810 Millennials (adults ages 18 to 32),2 conducted Oct. 7-27, 2013. The survey finds that, in spite of the dramatic gains women have made in educational attainment and labor force participation in recent decades, young women view this as a man’s world—just as middle-aged and older women do. 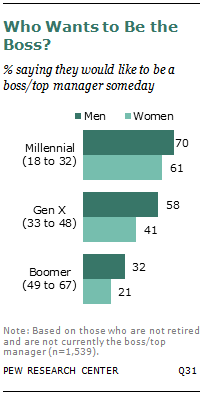 Roughly half of Millennial women (51%) and their older counterparts (55%) say society favors men over women; just 6% of both groups say it favors women over men. The survey findings are paired with a Pew Research analysis of census data that shows that today’s young women are the first in modern history to start their work lives at near parity with men. In 2012, among workers ages 25 to 34, women’s hourly earnings were 93% those of men.3 By comparison, among all working men and women ages 16 and older, women’s hourly wages were 84% those of men.4 And women in the younger age cohort were significantly more likely than their male counterparts to have completed a bachelor’s degree—38% versus 31% in 2013. Yet there is no guarantee that today’s young women will sustain their near parity with men in earnings in the years to come. Recent cohorts of young women have fallen further behind their same-aged male counterparts as they have aged and dealt with the responsibilities of parenthood and family. For women, marriage and motherhood are both associated with less time spent on paid work-related activities. For men, the onset of family responsibilities has a reverse effect on their career. The new Pew Research survey finds that among working parents of all ages with children younger than 18, mothers are three times as likely as fathers to say that being a working parent has made it harder for them to advance in their job or career (51% vs. 16%). The survey also finds that women are much more likely than men to experience family-related career interruptions. Among mothers who have ever worked, 39% say they have taken a significant amount of time off from work to care for a child or family member. This compares with only 24% of working fathers. Women who have experienced a significant career interruption in order to care for a family member have few regrets. They overwhelmingly say they are glad they did this, even though a significant share say it hurt their career overall. For their part, young women today who have not yet had children expect that when they do, the impact on their careers will be negative. Among those ages 18 to 32, 63% think that having children will make it harder for them to advance in their job or career. 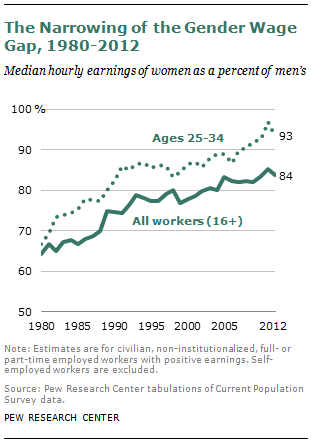 In 2012, the median hourly wage for women, full-time and part-time workers combined, was 84% as much as men ($14.90 vs. $17.79).5 In 1980, the gap had been much wider: the median hourly wage for women was 64% as much as men ($11.94 vs. $18.57 per hour, in 2012 dollars). The narrowing of the gap can be attributed mainly to the rising earnings of women. Armed with more education, greater labor force participation and an increased presence in more lucrative occupations, women have seen their median hourly wages rise by 25% over the past 30 years. But losses for men—particularly young men—have also contributed to the narrowing wage gap. 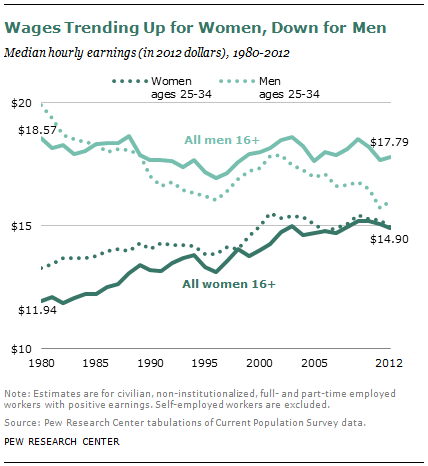 Overall, the median hourly wage for men decreased 4% from 1980-2012. The decline has been much sharper among young men (20%), contributing to the dramatic narrowing of the wage gap between young men and young women. Overall, women account for nearly half of the U.S. labor force today—47% in 2012, up from 43% in 1980. This trend is a result of the increase in their labor force participation rate, from 52% in 1980 to 58% in 2012. Among young women (ages 25 to 34), 74% were in the labor force in 2012, up from 66% in 1980. Labor force participation among men has declined significantly over the past 30 years, from 78% in 1980 to 70% in 2012. Each new wave of young adult men (younger than 35) has been less active in the labor market than the preceding wave. The employment and wage gains made by young women in recent decades are undoubtedly linked to the gains they have made in educational attainment. Among older Millennials today (those ages 25 to 32), 38% of women have a bachelor’s degree, compared with 31% of men. And among younger Millennials (those ages 18 to 24), women are more likely than men to be enrolled in college (45% vs. 38% in 2012). These educational gaps in favor of women emerged in the 1990s and have widened since then. Clearly, Millennial women are well-situated for career success and advancement. However, analysis going back to 1980 suggests that the gender gap in earnings may increase for them as it has for earlier cohorts of young women. Looking at the most recent cohorts of young women, by the time they reached their mid-30s, their earnings relative to those of men began to fall further behind, even if they had started out ahead of the previous cohort of young women. Motherhood is one factor, as it can lead to interruptions in career paths for women and increased time spent on unpaid work at home. Most Millennial women aren’t there yet, but when they do have young children at home, their level of participation in the labor force is likely to decline. Data on earnings, education and occupation do not provide insight into these unmeasured factors. However, data from the new Pew Research survey helps to illuminate the attitudes and experiences of men and women and give insight into how they navigate the workplace in an era of a narrowing, yet persistent, gender gap in pay. The overall trends that are revealed in the economic data are reflected in public attitudes about gender and work. Americans see less gender-based inequality today than they did 20 to 30 years ago. At the same time, a large majority says this country needs to continue making changes to give men and women equality in the workplace. Significant gender differences are evident on these measures—with women much more likely than men to say that the two genders are not treated equally. Women are united in their views across generations: Millennial women, who are starting their careers on fairly equal footing with their male counterparts, are just as likely as older generations to believe that women face an uphill climb in terms of being treated equally by society and by employers. Women are much more likely than men to say society favors men (53% vs. 36%). Women are also more likely to say that society needs to do more to ensure equality in the workplace (72% vs. 61% of men). The gender gap on this question is particularly wide among Millennials: 75% of Millennial women compared with 57% of Millennial men say the country needs to do more in order to bring about workplace equality. The strong sense among the public that more change is needed may be related to the perception among many that there are gender-based disparities in wages and in hiring. Fully 55% of the public says if a man and a woman are doing the same work, the man generally earns more. 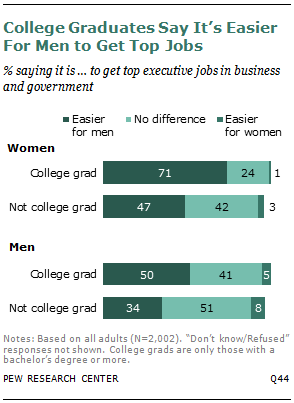 And 46% of adults say it is easier for men to get top executive jobs in business and government than it is for women (43% say gender does not make a difference in this regard). The gender pattern persists on these questions, with women much more likely than men to see built-in advantages for men in the workplace. In addition there is a significant education gap. College-educated adults are much more likely than those without a college degree to say that men generally out-earn women and that it’s easier for men to get top-level jobs. Among women with a bachelor’s degree or higher—the women most likely to be competing with men for top jobs—fully 71% say it’s easier for men to get these jobs than it is for women. Only 47% of women without a bachelor’s degree agree. While there is a general perception, especially among women, that men have an unfair advantage when it comes to wages and hiring, relatively few working adults report these types of gender biases at their own workplace. Large majorities of working men (73%) and working women (75%) say that where they work, men and women are paid about the same amount for doing the same job. Only about one-in-ten says women are paid less than men. Similar majorities of men (73%) and women (72%) say that at their workplace, women have about the same opportunities as men to advance to top executive and professional positions. Some 14% say women have fewer opportunities for promotions or advancement. Overall, one-in-seven adults (14%) who have ever worked say they have been the victim of gender discrimination on the job. A higher share of women (18%) than men (10%) report having experienced this type of discrimination. For those women who say they have been discriminated against because of their gender, about half say this had a negative impact on their career. For this relatively small minority of women (10% of all women with experience in the labor force), the negative consequences have been significant: the vast majority say the discrimination had a “big” impact on their career. In the new Pew Research survey, respondents were asked to assess the level of focus men and women bring to their careers. Across age groups, majorities say that the men and women they know who are around their age are about equally focused on their careers. 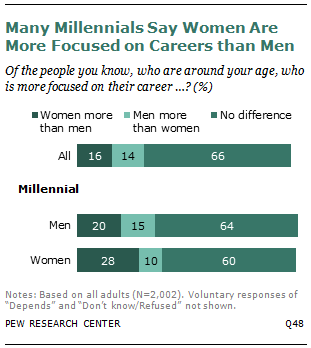 Among those who see a clear difference in focus between men and women, Millennials are the only ones who say women are more focused on their careers than men. Even so, the survey finds that women are less likely than men to say they have asked for a raise or promotion and less likely to say that they would like to be a boss or senior manager someday. Overall, 47% of adults with at least some work experience say they have asked for a pay raise or promotion at some point in their working life: 51% of men have done so, as have 43% of women. Among Millennials, 48% of men and 42% of women, a statistically insignificant difference, say they have asked for a pay raise or promotion. However, there is a wide gender gap among Gen Xers: 59% of Gen X men, compared with 47% of Gen X women, say they’ve sought to advance their career in this way. Six-in-ten men (excluding those who are retired) say they either would like to be the boss at their workplace or they already are the boss. This compares with 44% of women. Some 53% of women say they don’t have any interest in being the boss. These attitudes are shaped in part by where people are in the life cycle. Young adults are more likely than middle-aged and older adults to say they’d like to be the boss someday—possibly because they have more time ahead of them to reach that goal. Among those who are not already the boss or a top manager at their workplace, Millennial men are somewhat more likely than Millennial women to say they’d like to be the boss. 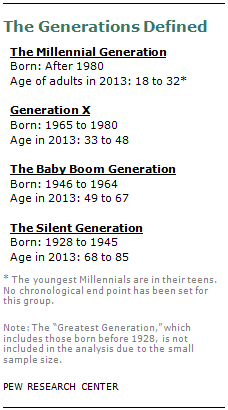 However, a significant gender gap opens up among Gen Xers and Boomers. Among Gen Xers, 58% of men, compared with 41% of women, say they would like to be the boss someday. Gen X women are among the most likely to have children under the age of 18, and this may well be a factor in views about how much additional responsibility they would want to take on at work. As the economic data suggest, the focus and intensity that many young women bring to their careers can diminish as they age and take on more responsibility outside of the workplace. The survey findings illustrate some of the specific challenges women face in accommodating the demands of work and family. 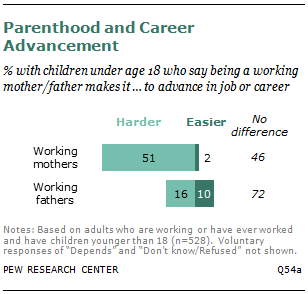 Among working women with children under age 18, fully half (51%) say being a working parent has made it harder for them to advance in their job or career. By comparison, only 16% of men with children under age 18 say being a working parent has made it harder for them to advance at work. When young adults who do not yet have children consider that possibility, most see roadblocks ahead. Fully 62% of childless Millennials expect that having children will make it harder for them to advance in their career. Roughly one-third (34%) say having children won’t make a difference in their career advancement, and only 1% say having children is likely to help them advance. There is no gender gap on this question among young adults. Millennial men and women tend to agree that having children will make it harder for them to advance at work. It is not simply having children that impacts women’s careers. It’s the steps they take to accommodate the demands that go along with being a parent. Survey respondents—both men and women—were asked about a series of things they may have done over the course of their working life in order to care for a child or other family member. These included reducing work hours, taking a significant amount of time off from work, quitting a job or turning down a promotion. Overall, 47% of all adults, whether they are parents or not, say they have done one of these things in order to care for a child or other family member. Parents are significantly more likely than non-parents to have taken these steps. (Some 55% of parents say they have done one of these things, compared with 24% of childless adults.) 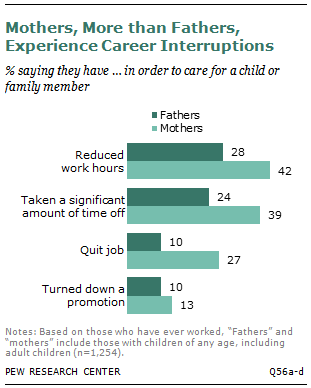 And among parents, a much higher share of mothers than fathers say they have had these types of career interruptions. Roughly four-in-ten women with children of any age (42%) say that at some point in their working life, they have reduced their hours in order to care for a child or other family member. A similar share of mothers (39%) say they have taken a significant amount of time off from work to care for a family member. Fathers are much less likely to report having done either of these things (28% of fathers have reduced their work hours and 24% have taken a significant amount of time off from work in order to care for a child or other family member). Roughly one-in-four mothers (27%) say they quit their job at some point for family reasons (compared with only 10% of men). Fewer mothers (13%) have turned down a promotion in order to care for a family member. Fathers are about as likely to have done this (10%). The survey finds that by overwhelming margins, adults who have altered their work lives in order to care for family members are glad they did it. Fully 94% of those who have reduced their hours or taken a significant amount of time off from work say they are glad they did this. And nearly as many who have turned down a promotion (88%) or quit their job (87%) in order to care for a family member say the same. For those adults who have experienced these types of career interruptions, many say it didn’t have much of an impact on their career one way or another. But among those who did see an impact, women are more likely than men to say it was negative. Among women who reduced their work hours in order to care for a child or family member, 35% say this hurt their career overall. This compares with 17% of men who reduced their work hours. Similarly, about one-third of women (32%) who took a significant amount of time off from work for family-related reasons say doing this hurt their career, compared with 18% of men. Chapter 1 of the report looks at trends in labor force participation and earnings and explores the demographic, economic and educational explanations for the gender gap in pay. The analysis is based on data from the Current Population Survey and the American Time Use Survey, both administered by the Census Bureau for the Bureau of Labor Statistics. Chapters 2-5 discuss findings from the new Pew Research Center survey. Chapter 2 looks at public views about how men and women are treated by society and in the workplace and explores what the public sees as the main reasons for the gender gap in earnings. Chapter 3 looks at what men and women value in a job and how attitudes toward career advancement differ by gender and generation. Chapter 4 looks at discrimination in the workplace—whether men and women have been discriminated against and how that affects their attitudes about work. Finally, Chapter 5 looks at the intersection of work and family life. How does being a working parent affect career advancement? 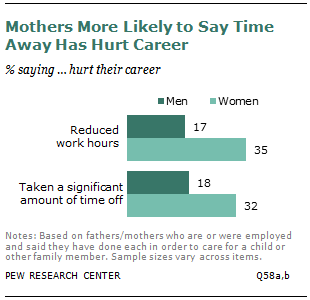 What sorts of career interruptions do men and women experience when they take time out for family obligations? And how is this different for mothers and fathers? Paul Taylor, executive vice president of the Pew Research Center, provided the editorial guidance and also edited the report. Kim Parker, director of social trends research, developed and managed the survey and wrote the Overview, Chapter 2 and Chapter 5 of the report. Rich Morin, senior editor, wrote Chapters 3 and 4 of the report. Rakesh Kochhar, associate director of the Pew Research Center’s Hispanic Trends Project, oversaw the analysis of census data. He was assisted by Gretchen Livingston, senior researcher; Rick Fry, senior research associate; and Wendy Wang, research associate. D’Vera Cohn, senior writer, wrote Chapter 1 of the report, based on the analysis of Kochhar, Livingston, Fry and Wang. Eileen Patten, research analyst, and Anna Brown, research assistant, assisted in data analysis, chart production, formatting and number checking. Marcia Kramer of Kramer Editing Services copy-edited the report. Findings in this report are based mainly on data from: (1) A new Pew Research Center survey conducted in October 2013, (2) The Current Population Survey and (3) the American Time Use Survey. Survey Data: The Pew Research survey was conducted October 7-27, 2013, with a nationally representative sample of 2,002 adults age 18 and older, including 982 adults ages 18 to 34. A total of 479 interviews were completed with respondents contacted by landline telephone and 1,523 with those contacted on their cellular phones. In order to increase the number of 25- to 34-year-old respondents in the sample additional interviews were conducted with that cohort. Data are weighted to produce a final sample that is representative of the general population of adults in the United States. Survey interviews were conducted in English and Spanish under the direction of Princeton Survey Research Associates International. Margin of sampling error is plus or minus 2.7 percentage points for results based on the total sample at the 95% confidence level. Labor Market Data: The labor market data are derived from the Current Population Survey (CPS). Conducted jointly by the U.S. Census Bureau and the Bureau of Labor Statistics, the CPS is a monthly survey of approximately 55,000 households and is the source of the nation’s official statistics on unemployment. Most of the trends in earnings, employment and labor force participation are estimated from the Merged Outgoing Rotation Group (MORG) files of the CPS. These are annual files that contain the records for the outgoing rotation groups from each of the 12 months. Representing one-quarter of the sample from each month, these are the only records with information on earnings. A typical MORG file consists of more than 300,000 records. MORG files for 1980 to 1994 were obtained from the National Bureau of Economic Research (NBER) and MORG files for 1995 to 2012 were constructed by the Pew Research Center. Additionally, trends in labor market participation by marital and parental status are obtained from the Annual Social and Economic Supplement (ASEC) file. Conducted in March each year, the ASEC file currently features more than 90,000 household interviews. These ASEC data were obtained from the Integrated Public Use Microdata database (IPUMS-CPS), provided by the University of Minnesota. Further information about the IPUMS is available at http://www.ipums.org. Educational Data: Data on college enrollment are from the U.S. Census Bureau, Historical Time Series Tables on School Enrollment, Table A-5a (http://www.census.gov/hhes/school/data/cps/historical/index.html). Data on college completion are from the March 2013 Current Population Survey. Time Use Data: The time use findings presented in Chapter 1 are based on the American Time Use Survey (ATUS). The ATUS is the nation’s largest survey on time use and the only federal survey providing such data. It was launched in 2003 by the Bureau of Labor Statistics. The ATUS sample is nationally representative and drawn from the Current Population Survey (CPS). The ATUS interviews a randomly selected individual age 15 or older from a subset of the households that complete their eighth and last interview from the CPS. Interviews are conducted over the telephone. The monthly sample is divided into four randomly selected panels, one for each week of the month. It is also split evenly between weekdays and weekends. The ATUS data files are released annually. The response rate for each year has been above 50% since the survey started in 2003. For more information on the ATUS methodology, see http://www.bls.gov/tus/atususersguide.pdf.